Scientists announced today (Sept. 12) that NASA's Voyager 1 spacecraft left the solar system in August 2012, popping free into interstellar space after 35 years of spaceflight. Voyager 1 and its twin, Voyager 2, launched a few weeks apart in 1977 to conduct an unprecedented "grand tour" of Jupiter, Saturn, Uranus and Neptune. The duo wrapped up this mission in 1989, then kept on flying toward interstellar space. SPACE.com caught up with Voyager mission project scientist Ed Stone, a Caltech physicist who has worked on the mission since its inception in 1972, to discuss Voyager 1's historic achievement and what's next for the venerable probe, which is currently about 11.66 billion miles (18.77 billion kilometers) from Earth. So how do you feel now that Voyager 1 has finally left the solar system? Stone: It's been a goal right from the beginning of the project to reach interstellar space. None of us knew how long that would take, because we didn't know how big the bubble was, nor did we know if the spacecraft could last that long. But now it's happened, and it's really a wonderful experience, because we're now beginning the exploration of an entirely new region of space where nothing has ever been before. So from a scientific point of view, it's really a tremendous event. And obviously from a historic point of view, Voyager now has joined the other great expeditions of exploration. How sure are you that Voyager 1 is actually in interstellar space? And how were you able to nail that down? 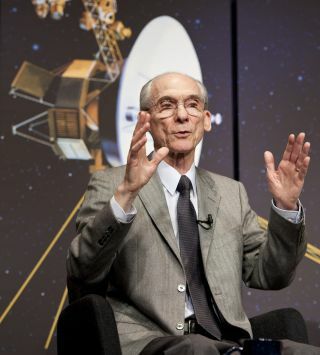 Stone: In this case, we were very lucky that the sun gave us an outburst of activity that eventually caused the plasma where Voyager 1 is to oscillate or vibrate, and that told us how much plasma was there. Why is interstellar space denser than the region at the edge of the heliosphere? We think of interstellar space as being emptier than our solar system. Stone: Certainly, compared to the density here where the Earth is, at 1 astronomical unit from the sun, it's denser here — the interplanetary medium is denser. But density of the medium falls off by the square of the radius, so that by the time you get to 100 AU, it's a factor of 10,000 less dense than it is here at 1 AU. And you might say, well, how does it press outward? It presses outward because it's blowing outward from the sun at a very high speed, so there's a dynamic pressure pushing outward, just from the speed of the [solar] wind, which is almost a million miles per hour. The gas outside is much colder, and of course the pressure depends upon temperature. Because it's so much colder, it takes a much denser gas to balance the plasma in the solar wind. So we have a dense, cold plasma balancing pressure against a much hotter, rarefied plasma. You'd been saying for a long time that you were looking for three signs that Voyager 1 had left the solar system: a drop in solar particles, a jump in galactic cosmic rays and a shift in magnetic field orientation. Voyager 1 has observed the first two phenomena, but not the third. Is the plasma-density data so compelling that you're not worried about the magnetic field direction anymore? Stone: It's the plasma from the sun which creates the bubble. So we would've preferred to measure the plasma and see the change in the plasma as we moved from the heliosphere into interstellar space. But unfortunately, our plasma sensor hasn't worked since the Saturn encounter many years ago. And so we had to rely on a proxy, and that proxy was the magnetic field, because the solar wind carries the solar magnetic field with it, and the interstellar wind carries the galactic magnetic field with it. So we thought, since we can't measure the plasma directly, let's look at the magnetic field to see if there's any indication in the field that there's been a change in the density of the plasma, and a change in the nature of the plasma. Unfortunately, there was an increase in field strength, but not [a change] in direction. So we felt that was not enough of a signature for us to be able to say for sure that we had left the solar bubble. But once we got the the plasma data itself in interstellar space, we knew we must have left the bubble. Why do you think Voyager 1 hasn't observed the expected shift in magnetic field direction? Stone: Well, I think the interstellar magnetic field is draped around the outside of the heliosphere, and it's the details of the flow of that interstellar wind which determines how those field lines are draped around. What we need to do now is go back and look more carefully at the models of that interaction. It's a fairly complicated interaction region. What are you looking forward to now, in this new phase of the mission? Stone: Every day we look at data, we know we're looking at data that no one has seen before, and that's in a region where nothing has ever been before. And I think we're all looking forward to learning a lot in the years ahead. It really is a totally new journey now that we're on. Do you have any expectations for what you're going to see? Or will you be looking with brand-new eyes? Stone: I think we'll be looking with brand-new eyes, because if there's one thing that Voyager has taught us, it's the most important thing we will learn is that which we didn't know we would learn. So we are constantly looking for things that we hadn't expected to see.